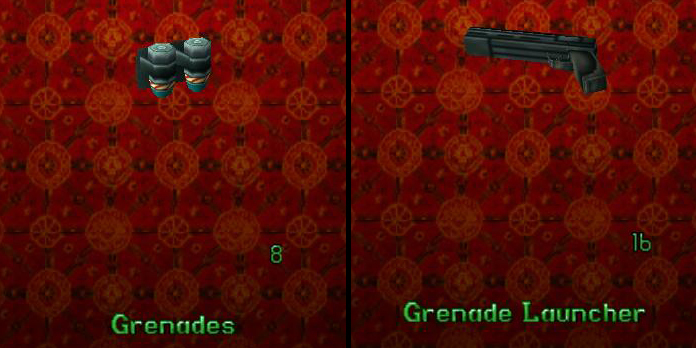 The following lists basic controls, as well as complex moves involving combinations of controls, and controls for vehicles in Tomb Raider 2 and the Golden Mask expansion. Most Macintosh keys are the same as those for the PC. Where they differ, Mac controls are listed in green. PlayStation controls are in blue. Instructions for saving and loading games, using the inventory, etc., are at the bottom of the page. Follow this link for the official manual in PDF format. Follow this link for a Tomb Raider 2: Logitech Profiler Game Profile created by CrimsonBlitz and posted on the Steam community forum. This page also includes notes about Weapons & Ammunition. More details are available in the walkthrough. IMPORTANT: Tomb Raider 2 includes some moves not available in the first game, but some of the moves and skills Lara has in TR3, 4 and 5 aren't yet available. She cannot crouch or crawl, sprint, climb on monkey bars, swing on ropes, etc. If you have never played Tomb Raider before, you should also familiarize yourself with the unique control system for jumping. It seems odd at first, but it is actually very easy to make Lara do what you want if you just follow certain basic steps, covered on my Tips & Strategy page. Press forward with left or right to move in that direction. Hold to pivot on the spot. Used in combination with the direction keys/buttons for slower movement. Lara will never walk off an edge, though she will run off. It's also handy for areas with spikes, broken glass, barbed wire, etc. Lara won't take damage if she WALKS through these. Makes Lara jump straight up. More complex jumps are covered under combo moves, below. Lara drops to the ground and comes up facing the opposite direction. Look (labeled "Ins" on some keyboards) shifts perspective to what Lara sees. Hold Look while pressing direction keys/buttons to look in different directions. Press once to pull out a flare and light it; press again to throw it in the direction Lara's facing. Lara can climb or swim while holding a flare, but she'll drop it when it goes out or she draws weapons. Walk to the edge of a drop-off. Turn around so Lara's back is toward the edge. Then press Action + Back to drop and hang from the edge. Continue holding Action to hang on. Release it to let go and drop. The safety drop minimizes damage taken from falling. Stand facing a drop-off about 2 steps from the edge. Press the keys/buttons for Roll then Action to drop, roll and hang from the ledge. Release Action to let go and drop. While hanging from a ledge (holding Action), use direction keys/buttons to move to either side. Release Action to let go and drop. While hanging from a ledge (holding Action) press Up to pull up. While standing, use the same combo to vault up on a low block or ledge. While hanging from a ledge (holding Action), hold Walk then press Up, and Lara will pull up to a handstand then do a walkover onto the ledge (generally useless but spiffy). If a ledge is too high to climb using just Action + Up, position Lara against the wall below the ledge and then use this combo to jump up, grab the edge and pull up. Same as the swan dive (above) except pressing the Roll key after diving makes Lara do a somersault (or two if there's time) on the way down. Facing ladder or other climbable surface, press Action then Forward and Lara will climb onto the ladder. She can also take a standing or running jump, above, and grab a ladder with Action. Release Action to let go. While hanging onto a ladder (or other climbable surface), press Jump to backflip off the ladder and land on the ground or on a platform behind Lara (see Tips & Strategy). When Lara needs to jump from a ladder and grab another ladder behind her, press Jump and either Roll or Forward to jump and turn in midair, then Action to grab the second ladder (see Tips & Strategy). Same as rolling on land. Useful in tight spaces or after pulling an underwater lever. Dog paddle (Up), backstroke (Down), pivot (Left/Right), sidestroke (same as Sidestep Left/Right). Note that Lara swims much faster underwater than she does on the surface. Swim to the water's edge and press Action and Up to pull up onto a ledge. Like Walk (above), this is used with direction keys/buttons to move more slowly; however, it won't stop the vehicle from going over an edge. As you play through the game, you'll collect various weapons and ammunition. Often you'll find ammo for weapons you don't yet have, since the more powerful guns aren't available until later in the game. The levels in which each weapon can be found are noted in the walkthrough headers. The walkthrough describes where. Every weapon is available in more than one location. So don't worry if you miss one; there will be other opportunities. At start-up, press Left/Right to rotate between snapshot (training level), passport (game options: new game, load saved game, exit), Walkman (music/sound volume), and keyboard/controller (customize controls). Press Enter to choose one. Additional hotkeys for adjusting graphics settings in-game are found in the instruction booklet. Following the steps above, go to the Controls icon in the main menu ring. Press Enter/Select. Press left/right arrows or D-Pad left/right to switch from Default Keys to User Keys. Use arrow keys or D-Pad to move to the control you want to change. Press Enter/Select to highlight it. Then press the desired key/button. If you choose a key that's already in use, the conflicting controls will blink until you change one of them. When you're finished, press Escape or Start/Triangle to return to the game. Copyright © 1998- Stellalune. All rights reserved. Special thanks to Maurice for the PlayStation menu controls. Feel free to link to this page but do not copy it. To give me your feedback, send email to or visit tombraiders.net. The name and likeness of Lara Croft, Tomb Raider screenshots and the Tomb Raider name and logos are copyright © Square Enix, Ltd. All rights reserved.